You've got questions. We've got answers to the most commonly asked questions at Duro Span Steel Buildings. Have a question not answered here? Give us a call toll-free at 888-848-2011. Our steel building specialists are standing by to assist you. What are Duro Span buildings made of? Our Arch style buildings are made of all AZ60/AZ180 SUPER GALVALUME PLUS coated steel. A special alloy containing Zinc, Aluminum and Silicone. How long does it take to get my building after I've ordered? Duro Span steel buildings deliver in about 3 - 4 weeks. Prior to receiving your building we will provide you with an easy to read erection and foundation manual. With a little planning ahead on your part, you can set concrete footing and site location. Can I get any size building I want? Yes. Duro Span buildings are available in widths from 10 feet to 100 feet and any length you require. Duro Span can deliver whatever size building you need, any width up to 100' and virtually any length you need. How do I know my Duro Span building will meet my local building codes? Every Duro Span building is designed to local building codes and in fact, we can provide you with stamped engineered drawings from a registered engineer who is licensed in your state. Why should I buy from Duro Span Steel Buildings? With over 25 years of experience in the metal buildings industry, Duro Span has the experience, quality and reputation you need when making a major, long-term capital expenditure. A simple, easy to lay, pre-drilled foundation connector makes building with Duro Span easy. Duro’s unique nut-and-bolt assembly provides strong, accurate, long lasting construction. For more information on the various types of foundations available, see the section of our site on construction. Can I insulate a Duro Steel building? Duro’s clear span, trussless design ensures that your building will easily accept any form of conventional insulation methods: spray on, fiberglass rolls or rigid foam. Installing ducting for heating and air conditioning is also very easy. The high aluminum content in our Galvalume actually helps keep the building cooler inside in the summer and warmer inside during the winter. In the The deep corrugation of the panel (which makes it uniquely 3-sided) leaves less exposed surface area which, along with our thick gauge steel, dramatically reduces noise. Duro understands the importance of ventilation to our customer. Our clear span buildings offer unobstructed airflow and superior temperature consistency. We offer two types of ventilation systems for our buildings—gravity and turbine—or you can install a custom ventilation. But isn’t a steel building an expensive option? That’s a common misconception. To start with, Duro buildings are easy to install. That results in lower assembly and building costs. Our buildings are virtually indestructible and maintenance free. Look at lower insurance costs and less overall maintenance over the years and you’ve got a winner. How long till I receive my Duro building? We can ship most buildings within 3-4 weeks from when you place your order with us. Duro buildings use panels fastened together with a single sized nut and bolt system. Since this construction method is uniform throughout the building process, adding more arches to your building for additional length is no problem at all. How well do Duro buildings stand up to fire? Duro buildings, due to their all steel construction, withstand fire extremely well. Interior fires can be contained within the building, protecting your home and other property. Fires burning outside will not ignite materials within the building due to the steel. Your building may be burned and blackened, but it will not fall down and will be virtually as corrosion resistant and protective for years to come. Raising the sides of your Duro building can be done by constructing your foundation to include concrete sidewalls. Customers usually use this method to increase the sidewall height by 2' to 4'. Also, depending on the building model, higher sidewalls may be available as a customized option. Can I put the building on a concrete or wood wall? Need to get more side wall height? Duro buildings can be constructed on a wide range of foundations, including one with high walls. Whether you build the side walls of concrete or of wood, the Duro foundation base plate allows you to construct your building the exact same way. Running electrical wiring is no problem at all with a Duro building. If you don’t know how yourself, you’ll likely want to get an electrician to do the work, but many of our customers have installed lights and power outlets, not to mention machinery requiring electricity. Horses, cows, pigs—whatever animals you care for, adding stalls and pens in your Duro building is easy. Without support posts to build around, you can add as many stalls as you need and make them as large as you want. Bulk storage is one of thousands of possible applications for your Duro building. Whether you’re storing grain, machinery, widgets or anything else, you’ll find that a Duro building provides you the space, protection and expandability you need. Skylights should be staggered from side to side to maintain maximum building strength. Skylights are easy to install since our skylight panels use the same single nut-and-bolt fastening system as our steel panels. And, with a number of color options, you even have control over the natural light coming into your building. No. Burying the building underground means that it is under constant weight, pressure and stress from the earth in which it is buried. Duro buildings are not engineered for this kind of use. Adding weight to the roof of a Duro building should be done with care. Duro buildings, once constructed can take a great deal of weight and stress. However, adding weight directly to the roof (a catwalk, for example) should be done only after consulting your dealer or an engineer. Side entrances can be built into any of the Duro Steel models. Your side entrance can feature a service door, sliding door or overhead door. As with end doors, you can use Duro doors or install a frame for any custom door. Duro Steel buildings are inspected on three separate occasions prior to shipment to ensure complete satisfaction. In the unlikely event that something is missing or damaged, simply call your dealer to report the problem. Replacement pieces will be shipped to you as soon as possible. How long has Duro manufactured steel buildings? Since 1998, the Duro Steel name has been synonymous with clear span, trussless, self-supporting arch style steel buildings. Duro Steel is a leading edge manufacturer and worldwide exporter of dependable, steel building solutions. Specialized in-house engineering facilities and our years of experience and expertise enable us to successfully design and create steel buildings for virtually any application. Are there installation crews available if needed? Yes, we are able to offer installation services on all our building virtually anywhere! Chances are you’ll have questions about your steel building at some point. While we’ve tried to answer as many as possible here, you may have additional questions. Contact Us with any additional questions. We are here to help! You can paint your steel building as you would any other type of building. For more information on how and what types of paint you can use, visit our pages on painting your Duro Steel building. 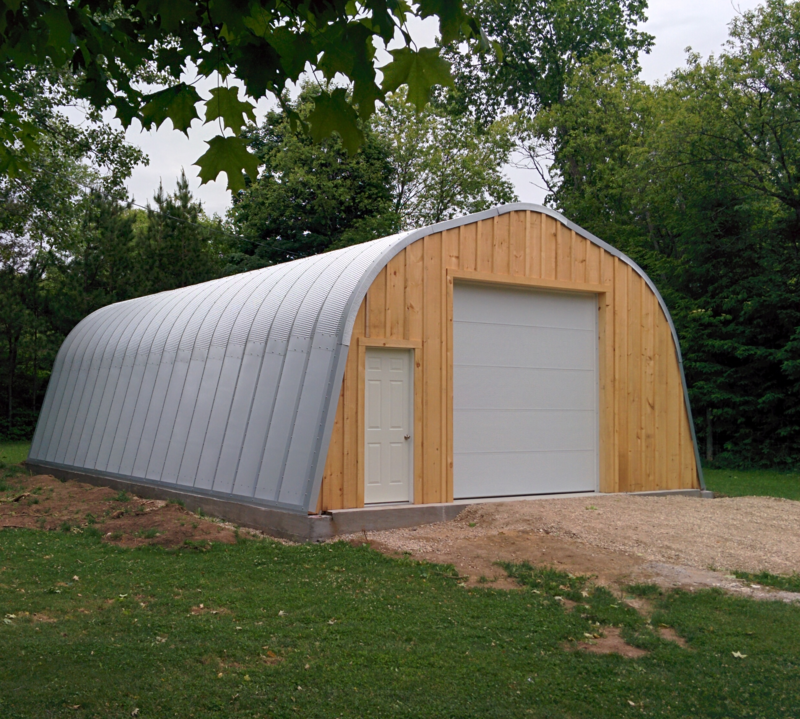 What types of warranties do you offer on Duro steel buildings? What prevents my building from collapsing under snow or due to high winds? Different gauges of steel provide varying degrees of protection from such forces as snow and wind. In an area of heavy snowfall or high winds, a thicker gauge steel will provide the strength and stability required to withstand these stresses. You dealer will recommend a metal thickness suitable for your region. Duro buildings are engineered to prevent leaking. Once constructed, each panel overlaps the next one down by 9”. Furthermore, each arch overlaps the next by 3”. Just follow the instructions in your construction manual and your building should be virtually free of any leaks. We know that a rusted steel building is an eyesore, which is why we manufacture all of our buildings from AZ180 Galvalume Plus ™ steel, which carries a 30-year warranty against corrosion. Your building should remain eye-pleasing for years and years. More than 75% of Duro customers erect their buildings themselves. Construction of a Duro building requires only four (4) people. Construction can be done with fewer or more people, but four people can get the job done, depending on the size of the building, in a matter of days. Steel thickness is measured in ‘gauge’. The lower the gauge number the greater the thickness. Duro uses 14 to 22-gauge Galvalume Plus ™ steel. We’ll recommend a lower gauge steel to someone constructing their building in an area of heavy snowfall or high winds. The thicker steel provides additional protection from such forces. How long can the building be outside before construction begins? If it is necessary to store your Duro building outside for a significant length of time, precautions must be taken. It is insufficient to simply cover the shipment with tarps; in fact, this is probably the worst thing to do. Cut the strapping and separate all arch panels with small pieces of dry wood to allow air circulation between all sheets. The endwall bundles must be totally separated so that no two sheets are in contact with each other. All parts should be separated and stored on dry wood blocking up off the ground. If Galvalume steel, stored outside for a significant amount of time, is allowed to become damp while in contact with other pieces, it may develop a white or dark grey deposit known as ‘wet storage stain’. If you follow the recommendations listed above, this staining will not occur.